It's so gloomy out today and with the cold weather, more comfort food was needed. I've never eaten pot pie before but it's one of my boyfriend's favorite meals so I figured I'd give it a go and see if I liked it as well. I love shepard pie and this reminded me a lot of that, except a fancier version because of the crust. The filling was really good but I think next time I might add a dash of cayenne and a teaspoon of sage. I was going to add cannellini beans to the filling but after making the filling I realized that it was too much already and I wasn't sure if the pie dish could hold the added beans. I made two crusts, one for the bottom and another on top but because my dish is so deep, it was really hard to get the bottom crust out and next time I might leave that out. 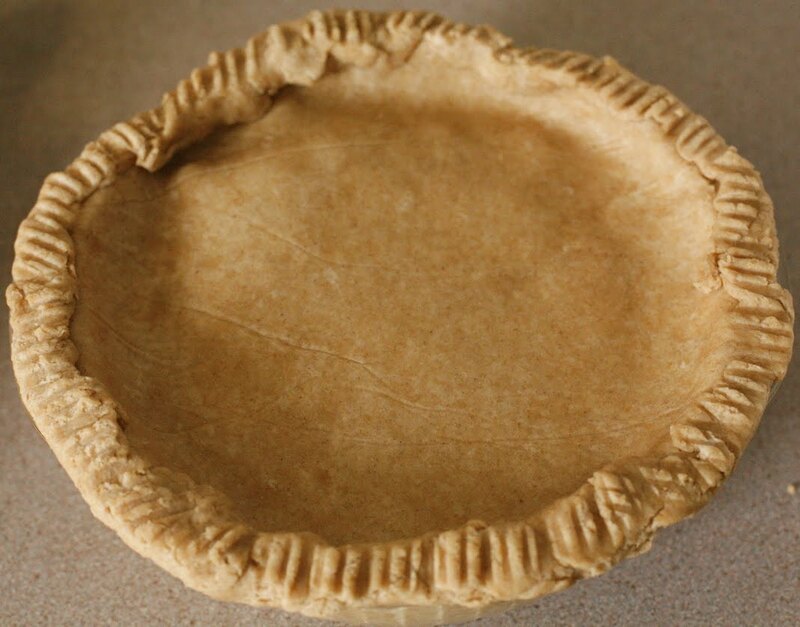 So unless you're using a little personal sized casserole dish or a shallow pie dish, I would leave the bottom crust out. I've been searching for a meal to take with me to my aunt's house for Christmas and I think this one might be it. Really comforting and something that would definitely impress guests. Have a 3 quart or oval deep dish ( 9 1/2 x 11 x 2 1/2 inch minimum ) casserole ready. 1. 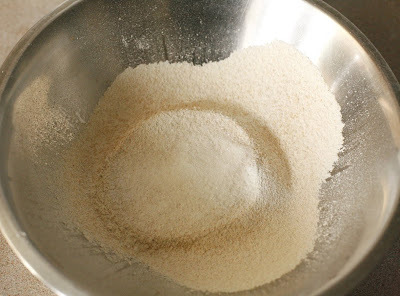 Combine the flour, sugar, salt, and baking powder in a large mixing bowl. 2. Add the shortening by the tablespoon, in small chunks, and cut it into the flour with a pastry cutter or two knives held together. 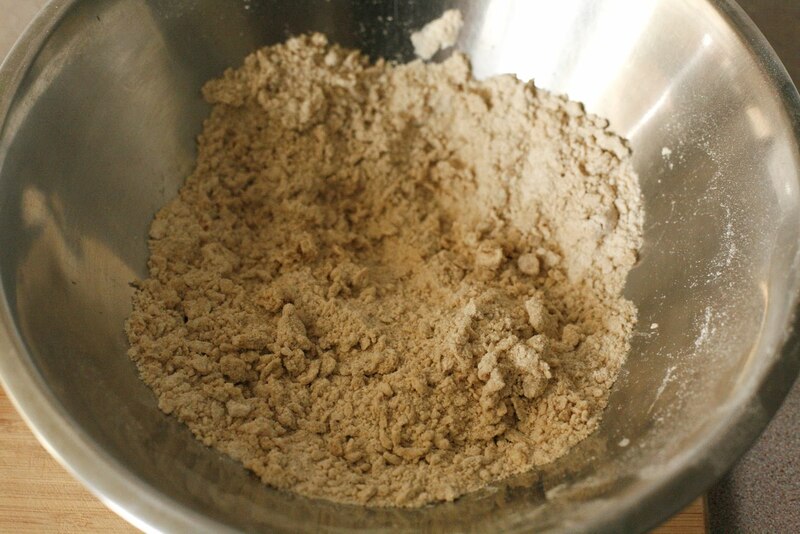 Cut in the shortening until the mixture is crumbly. 3. Pour 3/4 cup of cold water into a small bowl and toss in a few ice cubes. 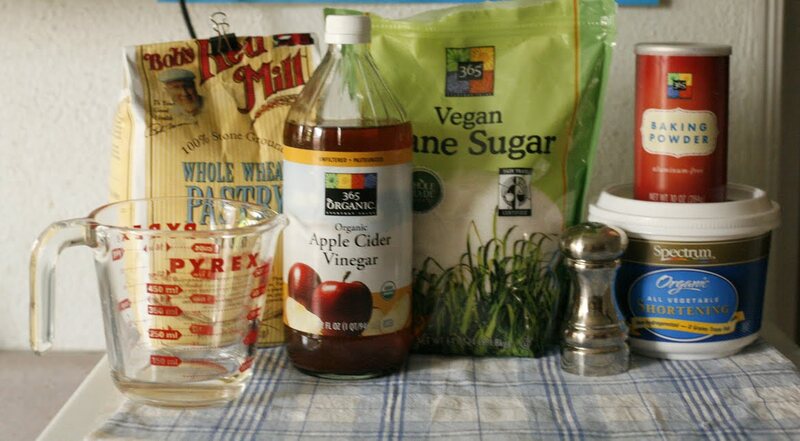 Measure out 1/2 cup of ice water and stir the vinegar into it. Add the vinegared water to the dough in three batches, gently mixing it in dough with a fork, until the dough holds together when pinched. If need be, add up to 1/4 cup more water, a tablespoon at a time until all the dry ingredients are moistened and a firm dough is formed. 4. 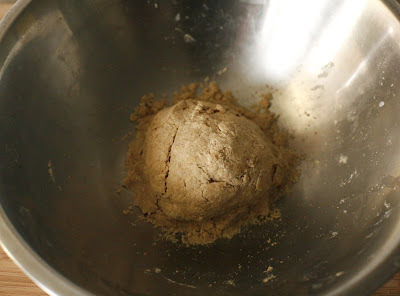 Gently press the dough into a ball. Sprinkle a clean work surface with flour, then roll the dough out to a shape of the casserole dish you'll be using but roughly 2 to 3 inches larger. 5. 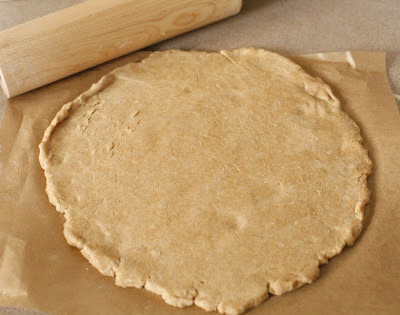 Place baking parchment or waxed paper on a cutting board and roll the dough from the rolling pin direction onto the paper. Cover the entire thing with plastic wrap or wrap in more waxed paper, and refrigerate while making the filling. 6. 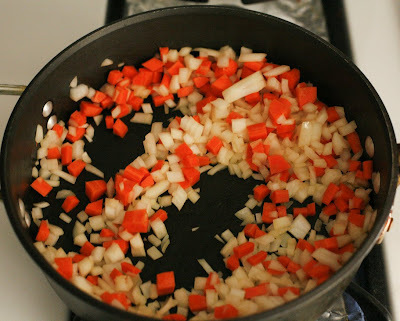 Heat a medium sized saucepan over medium heat and add olive oil. Add onion and carrot and cook stirring occasionally until onions are translucent, about 4 minutes. 7. 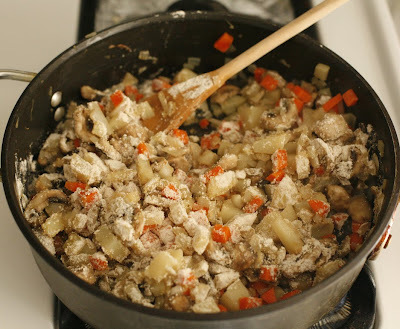 Add potatoes and mushrooms and cook for 6 more minutes, stirring occasionally. 8. Stir flour over vegetables and stir to coat evenly. Cook one more minute. 9. Slowly add the broth and the milk and stir constantly until everything is smooth. 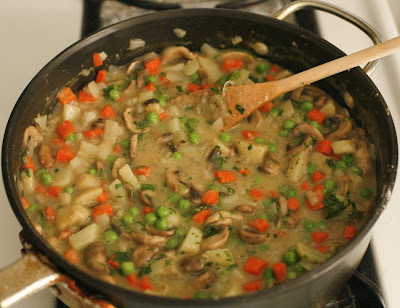 Bring to a simmer and cook until thickened, about 5 minutes, stirring occasionally. 10. Turn off heat and add peas and parsley and stir. Season to taste with salt and pepper. 11. Remove the piecrust dough from the fridge. Ladle the filling into the casserole dish. 12. Top with the crust, pressing the edges down lightly and leaving about 1 1/2 inch of dough hanging over the sides of the dish ( trim any excess dough beyond the 1 1/2 inches with kitchen scissors or a sharp knife ). Form a raised edge by turning or rolling up the dough at the edges of the casserole dish. 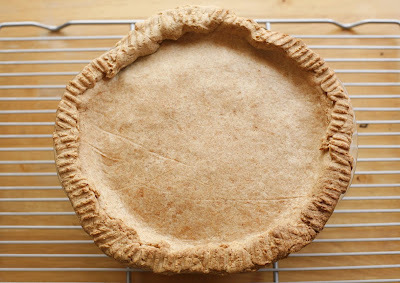 Use a fork to crimp these edges, and poke a few holes with that fork onto the top of the crust, to allow steam to escape. 13. Place in the preheated oven; this pie tendes to bubble and gravy could spill, so it's a good idea to place a large, rimmed baking sheet on the rack beneath it. 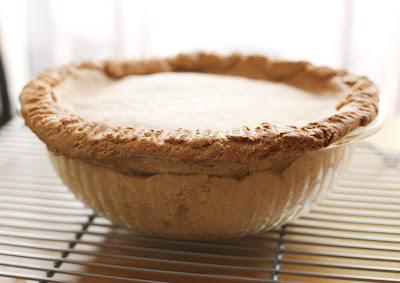 Bake for 40 to 45 minutes, until the filling is bubbling and the crust is lightly browned and flaky. If you like, brush the top with a little soy milk once or twice during the baking, for a light sheen on the crust. 14. 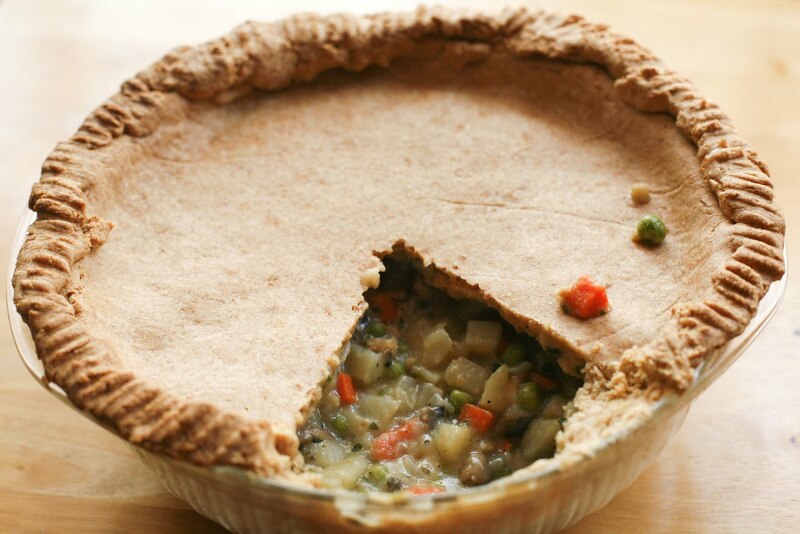 Allow the pie to cool at least 10 minutes before serving; the filling will be boiling hot straight out of the oven. 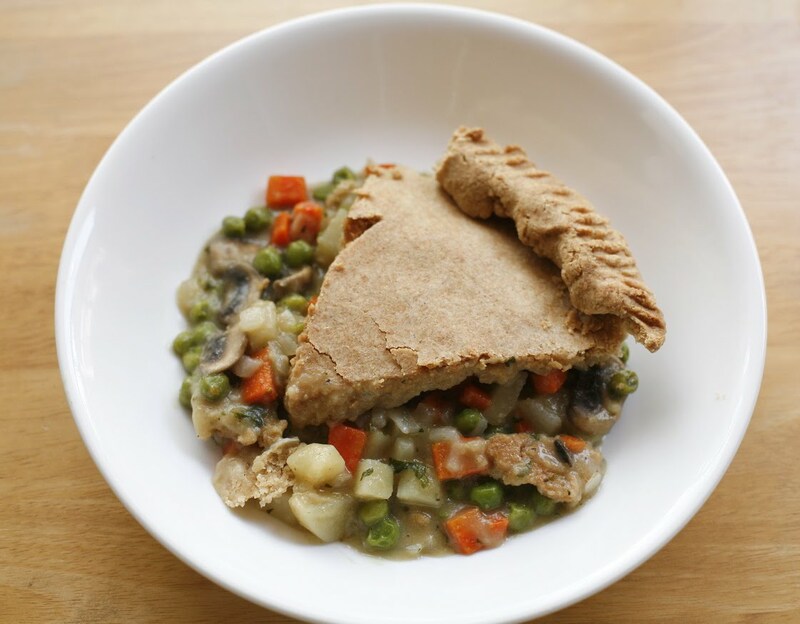 This looks good, especially if you came up with this recipe without having had pot pie before! Pot Pie is a popular dish in my house, but we used to make it with condensed soup and crescent rolls. 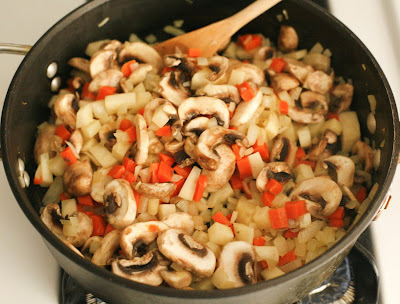 I was wondering how I would replace those - this looks just as hearty and much better! Stella -I can't wait to see your recipe when you do! This is so good. 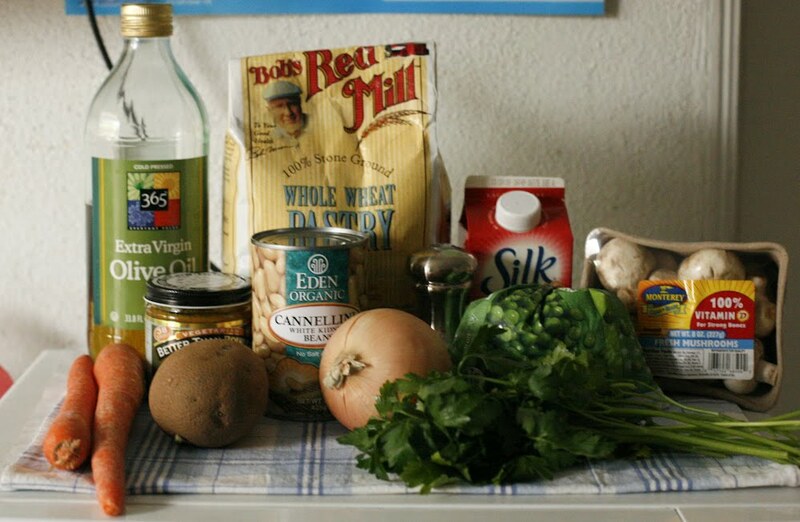 I am needing to make some pot pie of my own. Its getting cold here - out come the scarves and the gloves! This looks so good!! I love a nice veggie filled pot pie and this ones look so creamy and comforting... yum!! i'm ready to make my pot pie.. have all the ingredients except for the heavy soy cream.. didn't even know that existed. where do you get it? do you make it? I bought mine at Whole Foods but I've also seen it at other health food stores, such as Henry's and Sprouts. 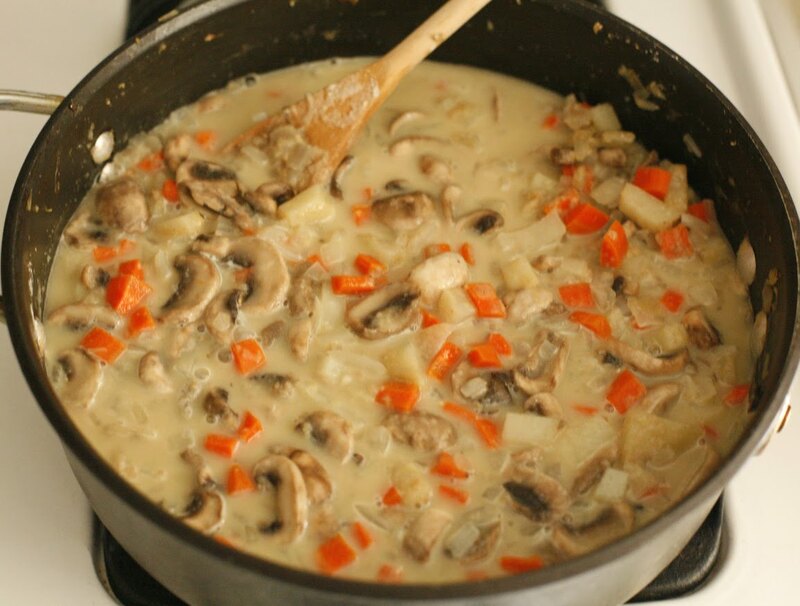 If you can't find it, you can probably substitute regular soy milk for the heavy cream and just add another 1/8 cup of flour to help thicken it. I couldn't find it at Sprouts but I'll check Whole Foods or Henry's. What is the name of the brand? I didn't see it in your photo of the ingredients. I called around.. Henry's and Trader Joe's don't carry it but Whole Foods does so I'm off to go get it! Well I went to Whole Foods and couldn't find it!! They had soy creamer, and soy whip cream for dessert, but I couldn't find soy heavy cream. I knew that Silk made a soy creamer but didn't know they made a heavy cream... or are you actually using creamer? 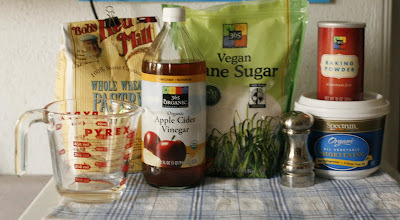 I did find something called Mimic Cream which looks like the best alternative to heavy cream - they have it at Cosmo's Vegan Shoppe (http://www.cosmosveganshoppe.com/Merchant2/merchant.mvc?Screen=PROD&Product_Code=MMCR&Category_Code=NDB&Product_Count=2). 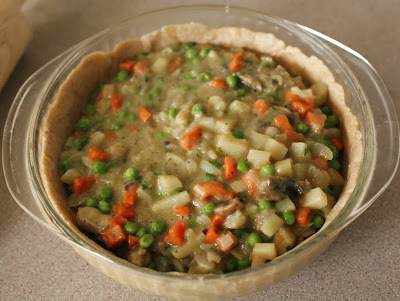 So I might purchase that online, in which case my pot pies will have to wait a few more days... unless you are just using creamer then I can pick that up at the store.. they do have the soy creamer at a few stores. I was confused with the instructions because step 9 says to add milk, but there is no milk listed in the ingredients... so I was guessing when you said milk you meant the cream? (we made two - a vegan one for me and the other one unfortunately had chicken stock and chicken in it for my husband who's a meat eater). I didn't put in mushrooms but added frozen broccoli. Next time I'm thinking of making a vegan cheesy sauce for the filling.